Some writers have the ability to wring a “YES!” from you, even when you are not paying them due attention. Scottish poet and essayist Kathleen Jamie is one such. This week passage after passage of her book “Sightlines” dragged me from distraction to attention, in particular her description of gannet viewing in Shetland. It was exciting, like a fun fair: the closer we got to the cliff edge the more we could hear the racket, the more the breeze brought us the smell. Suddenly I am a scant-bearded 20 year old again, approaching the Cape Kidnappers’ gannet colony on New Zealand’s North Island. After an awkward hitch-hike and a long walk in, we are impatient to see the famous birds. But it is the smell that strikes us first. Initially nose-twitching, it gradually moves through pungent to near gagging strength. The wildly whiffy birds add a sensory layer to a place that is already full of drama. 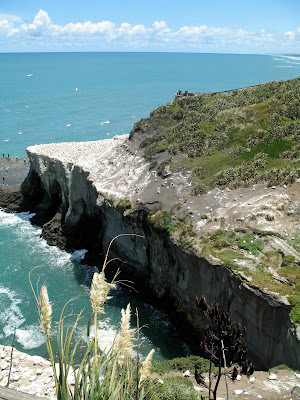 In Maori Cape Kidnappers is Motaupo Maui (“Maui’s fish-hook”), as it was the hook with which the demigod Maui pulled the North Island from the sea. 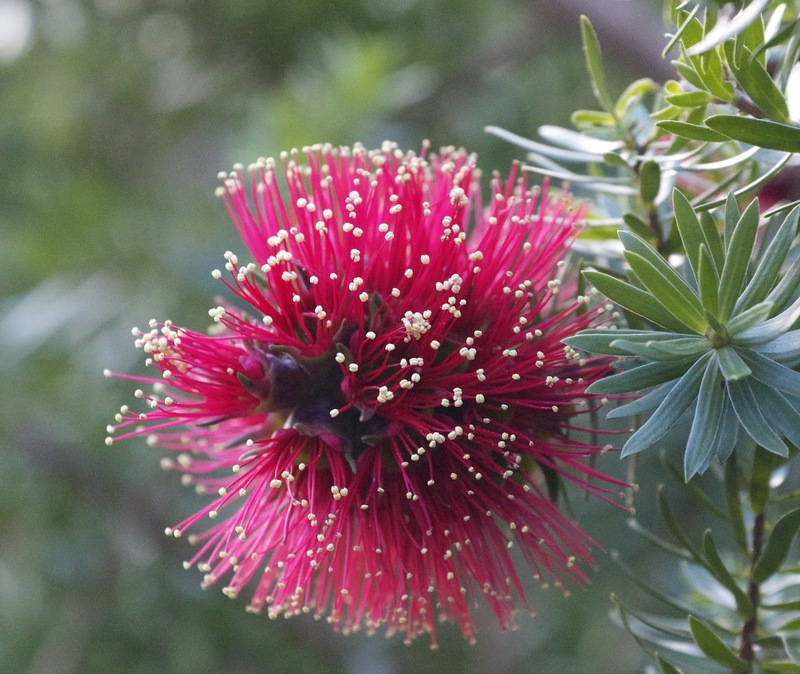 Its European name derives from an attempt by local Maori to kidnap a young Tahitian from Captain Cook’s ship Endeavour in 1769. 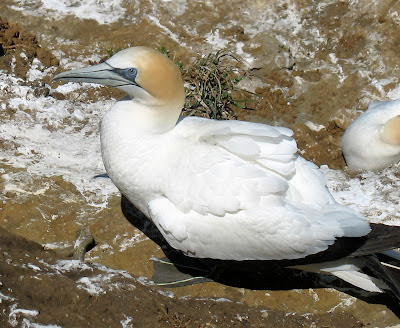 The Australasian gannet (Morus serrator) – or Takapu in Maori – is not a difficult bird to admire. It is strikingly marked, prodigiously beaked, swift and strong of flight and a peerless diver. Whatever characteristics elicit the word handsome, each individual gannet seems to possess them. But put 15 000 together, and handsome doesn’t come into it. We stop well short of the cape’s end point. Smelling, watching and listening to that many birds flying, greeting, fighting, feeding, sitting, crapping and calling is sensory overload. All was squalor and noise: the birds’ tenement was so plastered with guano that it shone, and the airborne birds cast winged shadows on the whitewashed walls. 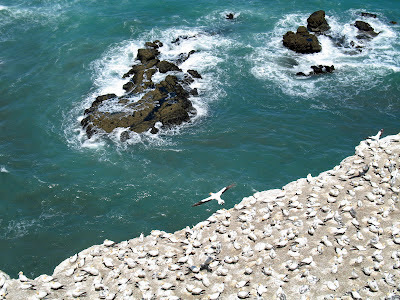 It would be many years before I would see Australasian gannets in large number again. Instead my next significant gannet encounter is with northern gannets (Morus bassanus), the same Kathleen Jamie describes. We are on Great Blasket Island, off the coast of Kerry in western Ireland enjoying a rare sunny summer’s day. It is a place that reeks of history, both ancient and recent, and that is why we are here. So it comes as a surprise when we find ourselves birdwatching for nearly half an hour. A dozen or more northern gannets are plunging again and again into the deep emerald waters of Blasket Sound. One of our companions explains that gannets have reinforced skulls, enabling them to drop into the ocean at speeds that would fracture the skulls of other species. That same speed enables gannets to “fly” underwater to great depths to catch fish and squid. The gannets we’re watching are too far off for us to hear them, but I fancy that I’m watching a wildly syncopated Irish dance, as each bird dives, rises, shakes and takes off again. It is again New Zealand that delivers our most recent gannet experience. Muriwai, west of Auckland, is a smaller, more accessible version of Cape Kidnappers, hosting a couple of thousand Australasian gannets. I cannot tire of watching these birds taking off, flying, landing and socialising. Considering they weigh around two kilograms each and have wing spans of nearly two metres, both their mobility and their sociability are admirable. Once the young birds are large enough and fat enough, they will fly over the Tasman to feed in Australian waters. It’s a reminder that birds don’t have borders. And that some of the threats they face, including their food sources being swallowed up by human overfishing, need both local and international attention. This week we felt the faint yet unmistakable signs of spring. Bird calls we hadn’t heard over winter, a strengthening of the light and a lengthening of the days, the scent of pollen in the air, and a strange desire to get things tidy. I’m sure we’re not the only animals to feel it. 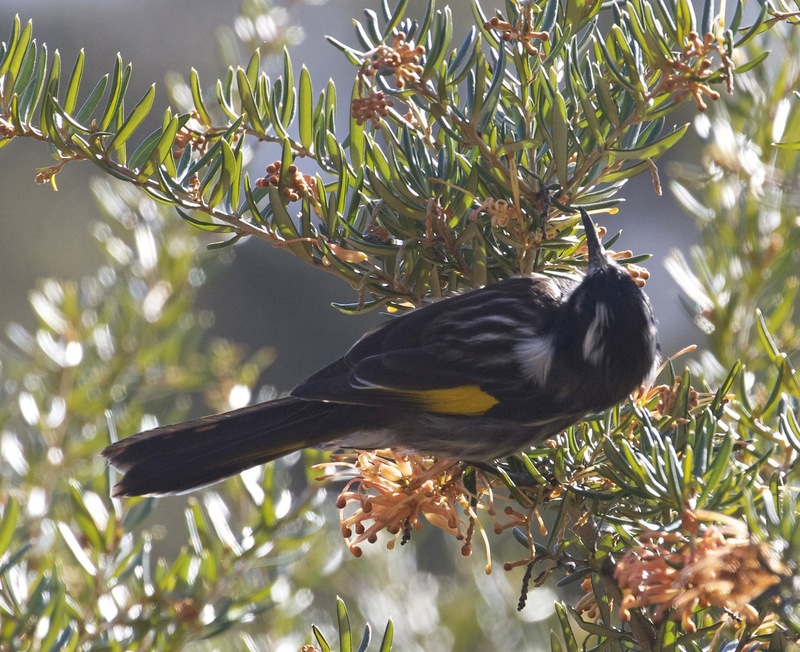 The bushes nearest our front door, always attended by birds, are now bursting with them, particularly honeyeaters. The birds come in waves to feed and perch and ready themselves for nesting. They range from our two biggest honeyeater species, the yellow and little wattlebirds, through the New Holland and crescent honeyeaters, down to the tiny eastern spinebills. Size doesn’t seem to determine success here, and nor does the pecking order remain fixed. Over many years we’ve watched shifts in the seeming dominance of species. But when it comes to frequency of visits, it’s the three small species that dominate around here. At times crescent honeyeaters, with their v-necked markings and ee-gypt ee-gypt calls, have been the most frequently seen and heard. Eastern spinebills, with their striking red eyes and sibilant tseep tseep-tseeep call, have flashed in and out of view quite often. I’ve often hoped for an unhurried look at their stunning livery and gracefully curved bill, but they always seem the flightiest and shyest of the trio. New Holland honeyeaters, they of the black and white stripes and loud chip-chip-chipper-chip calls, have been the reigning premiers here over the last few years. They have always seemed the cockiest, busiest and noisiest, using their slight size and weight advantage to harry other birds, including some considerably bigger. From my casual watching, I have gradually built up a kind of character profile of Phylidonyris novaehollandiae. Words like “bully”, “pushy” and “aggressive” may have snuck in there alongside less pejorative terms like “determined”, “adaptable” and “successful”. 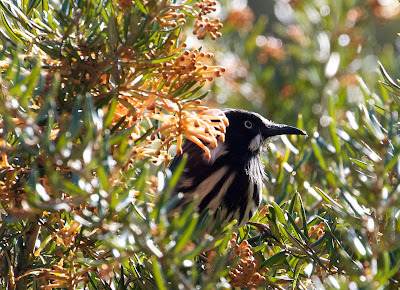 After today I wonder whether, in true Aussie fashion, I’ve been treating this honeyeater as an avian “tall poppy”. And have I been “barracking for the underdog” (ie the other birds) as a result? It gets worse. I should also admit that I’m not a huge Collingwood Football Club fan, and that the New Holland’s markings are very reminiscent of the Collingwood jersey. Prejudices have been based on flimsier matters. But this morning, while trying to photograph honeyeaters, I had the opportunity to observe some New Hollands up close over thirty minutes or so. Initially my prejudices seem confirmed: their stripey jerseys were everywhere, and the other birds seemed to be pushed to the margins. Certainly they were harder to capture on film. After about ten minutes the birds grew used to my presence, and seemed to become quieter and more settled. And then I noticed one large New Holland perched inside a grevillea bush. I quickly snapped a few photos, thinking it would flit off quickly, as all honeyeaters seem to do. It sat there. I snapped a few more – none of them good, as the bird was deep within the bush. And then I realised that was the point. This was a New Holland at rest. All that flitting around, all that feeding acrobatically on nectar, plucking insects out of the air, impressing mates, seeing off rivals, protecting the bush from “invaders”, must take its toll. At first I expected it would fly away after a few minutes. A few became ten, and still it sat there. It took a foraging crescent honeyeater to disturb its extraordinary stillness. Some things cannot be tolerated! Our New Holland clapped its wings and chased the interloper off to a nearby kunzia bush. And given the amount of nectar there – and everywhere else in our nearby bush – I didn’t feel the need to barrack for the crescent. Come to think of it, none of these birds asks to be cheered on. Short of making sure they have plants for food and shelter, and protection from our pets, there’s not much they require of us. Of course on our side, how immeasurably wonderful is it to have birds sharing these places with us? I’m not sure what I expected to find, driving from Canberra’s tableland down the undulating road to the coast. But when we stopped for a break at Braidwood, an odd mix of memories and connections surfaced. I had vaguely associated Braidwood with family stories of mild motoring adventures in days beyond memory. There was a bit of Toad of Toad Hall – poop poop and all – about my father, and his father. In cars that are now vintage they forded swollen rivers and braved dirt tracks in this district before Canberra even existed. I also associated the place with the poet Judith Wright. Hers was a poetry that had been with me all my life, from the pages of primary school’s The School Magazine onwards. And I knew that she had lived near Braidwood for the last few decades of her life. We had lunch in the town on the way to the coast, coffee on the way back. We explored a few other shops, and drove on. It was hardly an in-depth tour of Braidwood – and certainly not the way to gain any sense of the place that the great poet knew and wrote about. As I said, I’m not sure what I expected. But the experience did raise some larger questions. What, for instance, would it take for anyone to truly experience a place that has been made famous – “real” even – by someone of note. Is it possible to find William Wordsworth’s Lake District? Or in the Green Mountains of Vermont, might I discover Robert Frost’s road not taken? Or would the Pilliga ever reveal again what it revealed to Eric Rolls? What does it take for anyone, be they poet, writer, painter or photographer, to capture the sense of a place? Is it even possible? Or is the experience of place such an individual matter, and place itself so mutable, that we can only ever hope to triangulate it? Before one's country can become accepted background against which (one’s) imagination can move unhindered, it must first be observed, understood, described, and as it were absorbed. 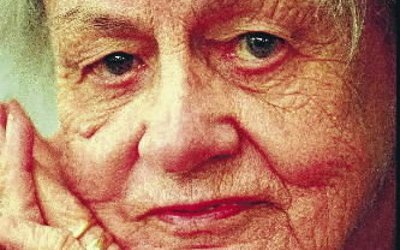 Another Braidwood writer, Jackie French, observed first hand Judith Wright’s ability to sit for hours on her bushland property, just watching. A poem like 'Lichen, Moss, Fungus' illustrates the fruit of such watching. Back in Hobart, the winter has been relatively benign. 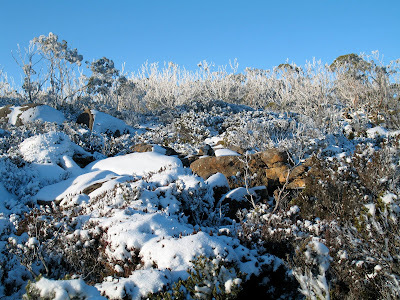 Nonetheless, while returning to health after a dose of the ‘flu, this week’s snow showers and frost had me recalling another Judith Wright poem, ‘Moving South’. After four days in a warm bed, I too should have been stepping carefully. But on the fifth day I was ready to welcome the cold embrace of the bush air, the banishment of cabin fever. It was time to again absorb this place. Soon the sun was shining its warm promise. 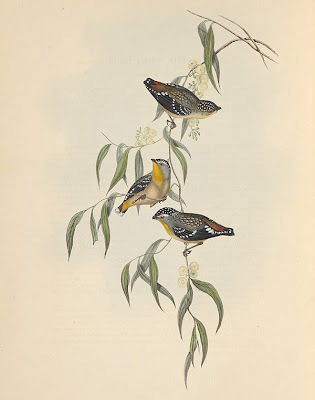 And when I heard the season’s first spotted pardalotes calling pee-paw from the tree tops, it put a literal spring in my step.